Standard Rocker Switch: Single Pole SPST On/Off with Red Neon 240VAC 16A. Fits 11 X 30mm Cut-out. 6.3mm Flat balde connectors. Standard Rocker Switch: Double Pole DPST On/Off with Green Neon 240VAC 16A. Fits 22 X 30mm Cut-out. 6.3mm Flat blade connectors. Relay DPDT 12V Coil. Each Contact 10A @ 250VAC. 10 @ 30VDC. 275 ohms. Operating Range 9V-13.2V. Silver Alloy Contacts. 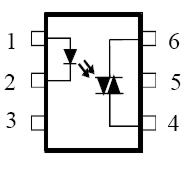 Opto Triac Zero Voltage Crossing.